The designers at VASAGLE work to give you the opportunity to turn your home into something unique and special with every piece of furniture. 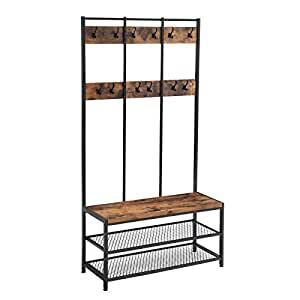 They designed this coat stand with a bench, giving you a comfortable seat as well as 2 mesh shelves for storing shoes and 12 hooks for organizing clothes. Designed in trendy industrial design with rustic wooden elements and a 30 mm thick seat, this coat rack is particularly suitable for large or open rooms that are not yet too crowded with other furnishings. Position the hat and coat stand in your hallway to hang jackets and coats and to put on your shoes comfortably. However, this hall tree should never be the only piece of industrial design in your home! Take a look at the other VASAGLE creations as well.